coming of age from the point of view of youth. 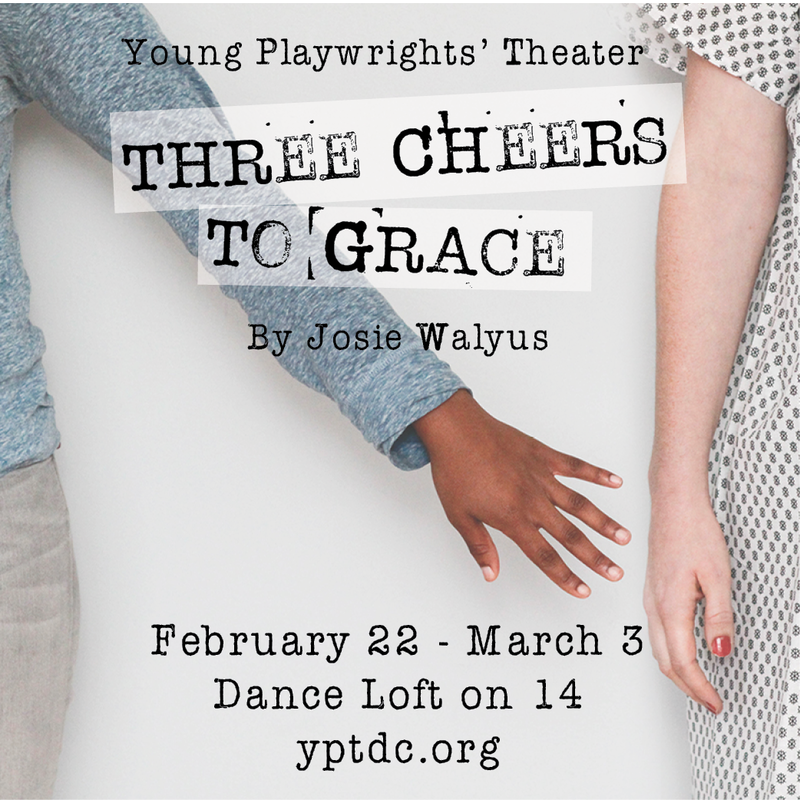 Washington, DC—Young Playwrights' Theater (YPT) presents the world premiere of Three Cheers to Grace by Josie Walyus, directed by Eric Ruffin on February 22 - March 3, Three Cheers to GraceWashington, DC—Young Playwrights' Theater (YPT) presents the world premiere of at Dance Loft on 14. For nearly 25 years, YPT’s professional artists have guided and performed hundreds of original youth-generated plays for their students’ peers and for the public, but this is YPT's first-ever production of a full-length play conceived and written by a high school student playwright and the first YPT event to be produced from our new headquarters in Takoma DC. In Three Cheers to Grace, a tragic car accident separates the fates of two best friends, one in a coma fighting for her life, the other trying to move past the trauma, struggling to stand by her best friend. Three Cheers to Grace features a diverse cast of passionate actors: Madelyn Farris, Katie Rey Bogdan, Elenilson Ayala, Suzanne Edgar, Stefanie Garcia, Mimsi Janis, Tre'Mon Mills, Naima Randolph, Sisi Reid, Karen Romero 2019and Marlon Russ. Members of the press are cordially invited to attend the invited dress rehearsal on February 21 or opening night on February 22 with a guest. Please contact Teshonne Powell at tpowell@yptdc.org or 202-387-9173 ext. 106 to reserve tickets. 15-minute version. YPT Artistic Director Farah Lawal Harris worked with Josie to make the play "festival ready," but after this experience, she felt that Josie deserved to see her full-length play realized on stage. "I felt we had to do more," says Farah. "Knowing that Josie had worked so hard and crafted such a beautiful play I wanted to set a precedent moving forward that YPT will help develop and produce the work of talented and equally passionate young writers such as Josie." When director Eric Ruffin (Black Nativity, In the Red and Brown Water) signed on to direct Three Cheers to Grace, he felt a calling to work with YPT to bring Josie’s play to life. Three Cheers to Grace is supported by the Mayor's Office on Latino Affairs, the DC Commission on the Arts and Humanities and the National Endowment for the Arts. Performances of Three Cheers to Grace are also sponsored by KPMG and EY. Run time is approximately 90 minutes. No intermission. Follow YPT on Facebook, Twitter and Instagram at @YPTDC. Learn more about the production at yptdc.org. Josie Walyus is currently a sophomore at H-B Woodlawn Secondary Program in Arlington, VA. She has always considered herself a writer and has been writing since elementary school. She was a 2018 New Play Festival featured playwright and currently is directing and writing for two school film projects. Young Playwrights’ Theater inspires young people to realize the power of their own voices. Young Playwrights’ Theater believes that creative expression and theater are valuable tools for the education, enrichment and self-actualization of young people. Through our programs and productions, we fulfill their creative vision by hiring professional artists to guide and perform original youth-generated work for their peers and for the public. YPT believes that it is important that youth, especially those whose voices are often minimized, have access to high-quality arts education that centers their experience and is culturally competent and affirming for all young people involved. In order to do this work, YPT acknowledges oppression and reduces its harm through our internal and external structures and practices. YPT believes that our students are inherently brilliant and we exist to share that brilliance with the world.